Happy Friday! How was everyone's week? Mine went by extremely quickly and work was really busy. I'm super excited for the weekend though and have some fun plans! 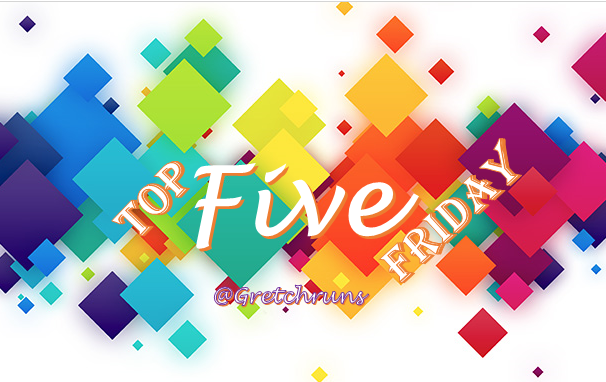 This week for Top Five Friday, I'll be sharing my top five athletic bottoms, as well as five workouts I did this week and five songs I'm currently loving! Today, I'm linking up with Clare, Katie and Heather. Also joining a new link up with Courtney at Eat Pray Run DC, Mar at Mar On The Run, and Cynthia at You Signed Up For What! Check them out! First up are my favorite shorts. These are so soft and comfortable! They're an older pair I got from the Nike outlet last year for about $10. I love to wear them at the gym and during races since they're so lightweight, and I also love the ruffle detail going down the side and the beautiful purple color. Next, I have a great pair of knee-length capris. These are from one of my favorite athletic brands- C9 from Target. Their clothes are really cheap and great quality! These particular capris are really comfortable and thick, and also have a really cool pattern. I like to wear these for just about everything, from spinning class to running! My third pick is a very basic, black pair of capris. These are my most recent athletic purchase, and I couldn't be happier with them! I also got these from the Nike outlet, and they were a great purchase. Everyone needs a basic pair of black bottoms! They're very flattering since they have a higher waist-band, which actually stays up for the workout. Sometimes with higher-waisted pants, the waistband can get stretched out and starts to fall down as your workout goes on, but not these! I wear these for my Group Power class. Up next is a recent purchase from my local running store, True Runner. These ankle pants are fantastic for mid-weather runs. Sometimes it's too cold to wear capris or shorts, but too hot for full-length tights or yoga pants. These fit perfectly into that gap, and are amazing quality. I can really tell the difference between these and all of my other bottoms. They feel so comfortable that I can barely feel them when I'm running, which isn't surprising since they're made by Brooks, one of my favorite running brands. My favorite part is that they have a water-proof zippered pocket in the back of the pants- no more sweaty/wet money or keys! I usually only wear these for runs, but they would also work great for spinning. Finally, my last pick is a pair of full-length tights. Anytime the temperature dips below freezing this is what I have on. They actually have a fleece lining that keep your legs really warm and cozy! I also love the print on these and love to wear them out for a run. I do have one warning for these-they run EXTREMELY small! I'm usually an XS or S in pants, and these smalls are really, really tight and a bit uncomfortable to wear around. If I had these in a Medium, they would never come off me! Monday- Couch to 5K workout with Dan. He's been killing it with these runs so far! I'll have to do a post on tips for beginners, because I've learned a lot helping him train. Tuesday- Centergy. We're almost done with our 10-week routine, and I'm getting excited to switch up the moves. Wednesday- I tried out a Pinterest treadmill workout I saw on Steff's blog (I did the Pyramid workout) while watching American Idol! Is anyone else watching that show? I usually don't, but decided to watch this season and I'm loving it so far. I really like Loren, JAX, Clark and Rayvon. Also can't get over how adorable and talented Daniel is! Thursday- Couch to 5k with Dan and Group Power. The C25K this week is running 3:00, walking 1:30, running 5:00, walking 3:00, and repeating. Friday- 6AM Spin class! I love this class even though I hate waking up so early and making the trek to the gym, but it's so worth it. I absolutely LOVE Pentatonix, and this is one of my favorite songs by them. They just announced they're going on tour with Kelly Clarkson and are stopping in Pittsburgh! Christina Aguilera is my all-time favorite singer, and this song is absolutely beautiful. When I first heard it, I was washing dishes, and had to stop everything I was doing just to focus on the song. I'm still in awe of how she sings! I've also been following The Voice this season, and I absolutely LOVED Travis's performance of Say My Name! I've always loved Destiny's Child, and this was such a unique version of the song. I can't wait to see what other songs he'll cover, and I hope he makes it to the live performances. Including this one just for fun..I found out it was the #1 song when I was born! (Kinda fitting, right?) What was yours? That's all for today. I hope you all have a great weekend! I love Pentatonix! Their music just makes me so happy. I haven't really gotten around to watching the new season of The Voice yet, but I did hear that song by Travis. He's really good! Thanks for linking up... Happy Weekend! I have a pair of fleece lined running tights. Soooo comfy and toasty! Hi Lisa! Thanks for stopping by. The C9 capris I linked are right at my knees, so they stay put for me! I've never noticed them bunching or getting uncomfortable at all. I might have to pick up another pair of them this year because I wear these so much! I LOVE Target workout gear - I'm pretty sure I have the same pair of capris and while I haven't run in them (I hate running in capris if I don't have to), they are great for weekend errands! I see SO many people wearing these same capris, especially at the store! They're so cute and comfortable. That's so funny that you hate running in capris- if I had my choice I would wear them every single day! They're much more comfortable for me than full length and shorts. They're the best of both worlds! Wait...the weather gets warm enough to wear capris and shorts? I can't imagine that! Ha ha! Sounds like a great week of workouts! I had to dig out all of these from wayyyyyy back in my drawers because it's been so long since I've worn them! Even going to the gym I want to wear pants because it's so cold out (and my legs are in NO shape to be seen, as shown above!) Thanks for stopping by and hope you have a great weekend! I love c9 gear too! It's great and affordable. I really can't spend hundreds of dollars on a couple pieces of gear so most of my stuff has come from either Target or the Nike Outlet. I'm actually headed down to the Nike store tomorrow! It's been on my agenda all week and I've been looking forward to it! Thanks lacey! Getting new workout clothes is half the fun for me...plus it makes me more motivated to workout :) have a great weekend! btw im jealous of your fit body. your legs look great! I'm a sucker for C-9 Capris I own a ton of them. At some point MAYBE spring will arrive here and I can creak out my shorts again. I'm looking forward to seeing the sun reflect off my white legs and blind motorists I pass ;) Have a great weekend! it must have been love is now stuck in my head :) thanks for joining us at the friday five! I've got Billy Joel on my playlist and like Scenes from an Italian Restaurant too. And, I confess, I remember when he released the song. Oh my. But, my favorite BJ running tune is River of Dreams. LOVE IT.